Here’s Ellie’s third and final chapter for y’all to read today. I especially enjoyed writing the scene with everyone drinking around the table at the end. I hope y’all will enjoy reading it, too. There are only two more weeks before you can read the entire novel here on the website, but you can still go to Amazon to order a copy before then. Either way, thanks for reading along. I hope you’ve enjoyed it. She pounded her fists against the cold metal until her knuckles were bloody and numb. She flung her body at the door in vain and slouched down sobbing uncontrollably with her cheek on the rubber conveyor belt. The door was closed. Her chance was gone. She had waited too long to bring her son to the beach, then she waited too long to live the experience for him. She failed again and again. He wasn’t even alive, and she continued to fail him. She wept and wept with her cheeks on the belt before she remembered that she had already set some of the discs. She picked one out of the pouch and pressed the little red button to see how long she had left. Five minutes. Five minutes. Was it worth it to try to leave? What did she have to live for anymore? If she stayed here and held the disc tight, they would all think that she decided to stay on the beach. She would disappear from existence just like that, erased from memory. She almost felt calmed at the thought of it. But she didn’t. She still hadn’t kept her promises. She could probably set more of the discs before she left. And if they could get her to the beach once, they could do it again. Couldn’t they? By that time she could do enough to pay for the privilege and not have to worry about making the same stupid mistake and missing her chance again. She had to do something. She couldn’t give up and wait for the explosion to erase her responsibility. That would be doing even more of a disservice to her son. She opened her eyes and picked herself up to jump down off the conveyor belt. The disc said three minutes now. She peeled off the paper backing, stuck it to the screen which told her what particular piece of crap was supposed to come down the conveyor belt every day, the machine that guided her work, the robot who used her, and she sprinted out of the hall, down the stairs, and out of the building entirely, not stopping until she left the front door, and then only slowing to a fast walk—she didn’t really have time to act nonchalant. She was only half a block away from the building when she heard the explosion. Her heart pounded at the sound, and her feet tingled. She could feel the ground moving beneath her, as if the whole world was shaking. She felt like she wanted to run, but she stopped herself. Then she wanted to look back. She stopped herself from looking at first, then thought it might be more suspicious not to look and decided to turn and see what she had done. An entire floor of the building—not as high as she thought it would be—was blown out, but the rest of it was still standing. There was a blasted-out gash, bleeding rubble, water, and electricity. Not as much damage as she had expected, she thought the whole building would come down, but she had left a mark at least. She turned and hurried on her way toward the elevator to ride it to her bar. What else was there for her to do? She had just laid bombs in her workplace and blown it to smithereens. She had been to the beach and back in less than fifteen minutes. She had kept all her promises and broken all of them all at the same time. What was she to do but get a drink and enjoy the rest of Christmas? The public elevator had no one. The street to the bar was empty. The bar was dark when she got there. It was closed. Of course it was closed. Even the bartender had a family to spend Christmas with. Even Gertrude. Everyone did. She kicked the door. Stupid stupid stupid. She had drank her last beer and eaten her last egg before she went on her mission. She wasn’t supposed to be coming back. She should have been on the beach, figuring out how to make a fishing rod or a spear, but instead, she was standing in front of a closed bar with nowhere left to go. Her hand flicked over the address card in her pocket. Well, almost nowhere. Gertrude had invited her over. She wanted to know all the details, Ellie was sure. She’d probably have a drink to share, and some food. It was Christmas after all. And it would be nice to tell someone about what had happened, to unburden some of it somehow. Though she wasn’t quite sure how much of it she wanted to tell. She pulled out the card and made her way to the nearest public elevator. Ellie felt like she was intruding on something. “No—I, uh,” she said. “I don’t want to be any trouble.” But it was no use because the door had already buzzed open and the intercom link had popped shut. The room was full of people, but Ellie could tell it was emptied of things to make space for them. There was no bed in sight, and from the looks of it, this was the only room there was. Instead of a bed, there was a foldable table in the middle of the room with three people sitting around it. Ellie didn’t recognize any of them, and she could tell by the arrangement that she was taking Gertrude’s seat. She couldn’t see any more chairs, either. She felt even more like she was intruding despite the full drink in her hand. He smiled, and blushed, and took a big drink out of his glass. “Oh, lighten up, dear,” Gertrude said, smiling. “It’s Christmas, a time for celebration. Your discs went off with a bang.” She laughed. Ellie didn’t know how to answer. She took a long sip of eggnog to buy time. Technically she didn’t choose to join the cause. It was just the only option she had left. So maybe she had joined the cause after all. Whatever. It was easier to nod along either way. “Welcome,” the woman said without waiting for further answer. “I’m Vicki. This is Alena.” She pointed to the fourth person sitting at the table. “We’ve known Trudy since before she got promoted and moved to this high class place.” She smiled and winked at Gertrude who laughed. Ellie shook her head. She didn’t know who she would tell. “Is all that necessary?” Alena interrupted her. “Uh, well. I don’t know,” Vicki said, shrugging. “I don’t know how much she wants to know. Anyway. We worked our shift, right. And at the end of it—just like the Scientist said—the bots all turned off at once.” She snapped her fingers. “Just like that. And we…Well, we were free to do what we had to do without interference. Aldo smiled and sipped his beer. “Brilliant,” Gertrude said, beaming. “Wonderful. Amazing.” She sounded tipsy. “You fill my heart with joy. Tis the best Christmas gift a girl could ever ask for.” She walked over and planted a big kiss on Aldo’s forehead. “C’mon man,” he said, wiping it away in disgust. “You blew up a power plant?” Ellie said. Everyone in the room looked at her, and she regretted opening her mouth. “See!” Aldo said, as if she had already told someone about his involvement. “But can’t they just—I’m sorry.” Ellie shook her head. She had almost let her mouth run off on its own again. “I…uh…” Vickie looked to Gertrude for an answer. “I—I didn’t set them all,” Ellie blurted out, pulling away from Gertrude’s embrace. She took a big swig of eggnog. “Where are the rest?” Aldo said. “But I didn’t…” She shook her head. Alena laughed. “Scaredy cat,” she said. “I downloaded my files,” Alena said with a grin. “By a cat!” Alena laughed. “Oh, yeah. Well…” Ellie sipped her drink. “Ellie works in QA,” Gertrude said to the group. They all looked at her like that meant something to them. “Well, I got to see the beach,” Ellie said when the attention had grown to be too much. “Tell us, dear,” Gertrude said. “I hate fish,” Alena said, crinkling up her nose like she could smell it then and there. “And the sand,” Ellie went on, unable to stop reminiscing. “Oh, the sand. It was amazing. I just want to bury my feet in it right now and feel the ocean breeze. It was like the biggest sandbox you had ever seen. I don’t know.” She shook her head. “I was a child again for fifteen minutes.” She remembered Levi and finished her drink. “Would you like some more eggnog, dear?” Gertrude said, already getting a pitcher out of the fridge. “In the Christmas spirit.” She poured some into Ellie’s glass. “And they’ll be there longer, too,” Aldo added. “You’ll be here longer than any of us,” Vicki said, laughing. Aldo and Alena joined in, too. Ellie gave a little chuckle herself. Ellie sipped the eggnog and it felt warm throughout her body. She looked around the room and actually enjoyed the faces she was surrounded by. It was a feeling she missed. She didn’t know these people, but she felt like she did. She felt like they knew her, too. Though not even Trudy did. But did any of that matter anymore? Did anyone know anyone? No. And these people were welcoming her into their family. “You didn’t choose to stay in the mountains?” Ellie asked, a little embarrassed by the question. Of course Alena didn’t choose to stay in the mountains, otherwise she wouldn’t be there to answer the question. “Just in time, too,” Alena said with a smile. “Aldo!” Gertrude said, spitting up some eggnog. “And she still tries to convince me to go back every day.” Alena laughed. “Well why don’t you want to leave?” Ellie asked. Everyone laughed. Ellie, too. She was feeling more comfortable the more eggnog she drank. “Oh, well…” Ellie sipped her drink. “How close were you?” Vicki asked, leaning in closer. “Maybe a block away,” Ellie said. “My ears are still ringing.” She stuck a finger in one ear and wiggled it around to drive the point home. “Did you see the damage?” Vicki asked. “Is that right?” Vicki looked at Aldo. Everyone clanged their glasses over the table and took a big swig of whatever they were drinking. “And you know you two are always welcome, dear,” Trudy said with a smile, setting her own glass on the table. “Just come ringing, and if I’m here, there’s something to drink.” She winked. “Well, we’ll be here tomorrow afternoon to get some more news,” Alena said. “Right?” She raised her eyebrows. “I’m hoping as much as y’all are, dear,” Trudy said. “You, too.” Ellie said, holding out her hand, but Alena came in for a hug instead. Vicki shook hands with Aldo and hugged Trudy then stopped in front of Ellie. “You did good today,” she said. “I could have done better,” Ellie said, shaking her head. Ellie didn’t know how to respond. “I look forward to working with you in the future,” Vicki said. She shook Ellie’s hand. “Bye y’all. See you tomorrow.” She waved to everyone as they left. The door closed behind them, and Trudy finally took a seat. Ellie felt bad for forgetting that she was standing for all that time. She wanted to say something to make up for it, but nothing was sufficient. Aldo looked at her like he didn’t believe what she was saying. “Uh…thanks,” he said. “And nice to meet you.” He nodded at Ellie and slipped through the door. Ellie sipped the last dregs of her eggnog. She set the empty glass on the table. “So I was your second choice,” Trudy said with a smile as she went to the fridge to pour two new glasses of eggnog. “I knew it!” Trudy said, almost spilling the drink she was pouring. “I knew it. “You knew what?” Ellie asked, frowning. “I thought you had never been across,” Ellie said. 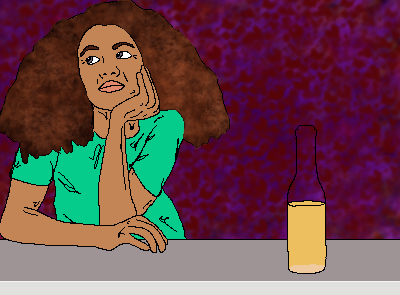 “I thought you wanted to join the struggle.” Trudy smiled and sipped her drink. Maybe Ellie didn’t know as much about Trudy as she thought she did. “So?” she said. Thanks again for following along. I hope you’ve enjoyed it. Please think about buying a copy from Amazon to help support my future writing endeavors. And have a great weekend.